Speckled Perch and Panfish is where light to ultra lite spinning tackle in the 4# to 8# catagory really shine. You need to be able to cast lures as light as 1/32 of an ounce and be able to cast a lip hooked minnow without throwing it off. For crappie, 6# is about as perfect as it gets. For a rod, get a light action such as a Shakespeare Ugly Stik Lite, 5'6" rated for 4-8 lb line, 2 piece. Model SP1156-2L. 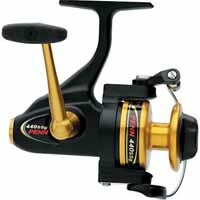 Match this with a Penn 420ssg reel or equivalent and spool with 4# to 6# line and you are set. 4# will give better casting distance, especially with the lightweight lures you will be using, while 6# may be better if you are trying to pull crappie out of thick cover such as a brushpile. If you plan on doing a lot of fishing for bluegills and other bream then 4# is definitely the way to go. While younger crappie will eat a variety of aquatic insects grubs and other small forage, as the fish grows, so will its appetite for various species of minnows found in our lakes and rivers, and for the largest fish your choice of baits and artificial should reflect this. Below are just a few lures designed for crappie or bluegills to get you started. Jigs; Crappie jigs are made by a variety of manufacturers and though they are call crappie jigs they will catch bluegills and even a few bass as well. They can be cast and retrieved in midwater and along the bottom, jigged from a boat over structure and cast with a bobber and retrieved. Fish it bare or tip with a minnow. Comes in sizes 1/8, 1/16, and 1/32. One of the classic lures of its kind. Spinnerbaits; The spinnerbait style shown at left with a plastic grub type jig has been one of my favorite lures for freshwater ever since I bought my first Beatlespin lures in the 1970s. Bass, bluegills and crappie have all fallen for it reliably enough for me that if I approach a lake or pond for fishing it is one of the first lures I will throw. Shown at left is a Charlie Brewer Crappie Spin, Comes in one size, 1/16 0z. 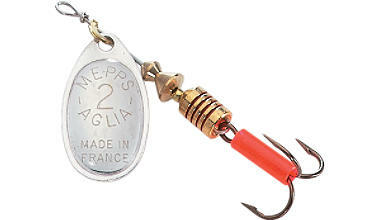 Mepps Spinner; Invented by French Engineer Andre Meulnart in 1938, the Mepps Spinner in its various forms has become one of the top producing lures in the world, and one of my favorites. Try the size 1 or 2 for crappie, the size 0 or 1 for bluegills. Larger sizes can be used for bass. Word of caution however, always use a good quality snap swivel between this lure and your line as it will cause considerable line twist otherwise. 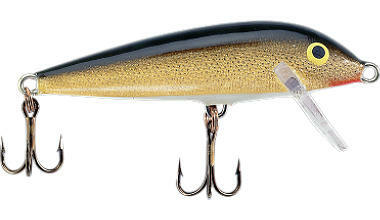 Rapala Countdown; The two smallest sizes of this lure can be crappie and panfish killers. They have a sink rate of about 1 foot per second, meaning you can fish at a predetermined depth by casting and then counting seconds before starting your retrieve. They can be fished as a crankbait with a steady retrieve or as a twitch lure. For crappie and bluegills use either the model CD1 at 1" in length and 1/16 of an ounce or the model CD3 at 1-1/2" and 1/8 of an ounce. Crappie are one of the most popular fish in America and dozens of rigs to present live minnows to them have been developed over the years by various crappie experts. However, we are going to go with three of the simpler rigs to get started. When fishing live minnows for crappie, you need to match the hook size to the baits you are using in order to get a natural of a presentation as possible. These baits are fairly small and a long shank light wire Aberdeen style hook is the hook of choice. For baits that are about an inch or so, use a size 4, while for baits approaching 2 inches in length, use a size 2. For fishing with a float or bobber ther are two types of floats to consider. For shallower water or if you are going to suspend a bait at a depth of under about 3-4 ft, then a standard clip on float will suffice. I prefer a torpedo shaped float as small as I can use without the rig pulling it under. However, there are many times when you will find the crappie in deeper water and reaching the right depth and holding the bait at that depth can make or break a fishing trip. Trying to cast a clip on float rig with 6 or more feet of line between hook and float can be a real problem. This is when you may want to consider a Slip Bobber. Here are the basic steps to making the rig. 1. Pull as much line as you want the bait to be suspended from the surface through the guides of your rod. 2. With a piece of string, rubber band, or piece of fishing line tie a stop knot at the depth you want around the line from the rod. Clip the extra line from the knot leaving just enough for the knot to hold so that the knot will pass through the guides of the rod during a cast. 3. String a stop bead onto your fishing line and slide it up to the knot. 4. String the Slide Float onto your line. 5. Tie the aberdeen hook to the end of your fishing line. 6. Install a split shot weight about 12 - 18 inches above the hook. For instructions from an expert on rigging this and other float types consult the expert of all experts, the Slip Bobber Swami! With this float rig, when you reel in the slip float and bead will slide down to the split shot, allowing you to reel in the stop knot onto the reel. This way you are only casting with a little more than 12 to 18 inches out of the rod tip. When you cast the stop knot will come off the reel and pass through the guides. When the rig lands in the water, the split shot will pull line through the slip float until the stop bead reaches the stop knot, stopping the float and suspending your bait at the required depth even though it may be 10 or more feet down. Sonar Unit; Crappie come near shore during the spawning season Crappie will typically spend a considerable time of the year in deeper water around submerged structure, brushpiles, or submerged vegetation. 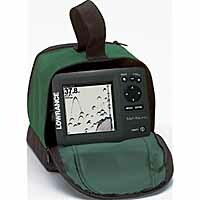 If you have a boat and want to get serious about catching crappie throughout the year on a consistent basis, you really want to invest in a sonar unit. You can get two different types. Some portable self contained units have internal rechargeable batteries and are ideal for small boats, rental boats, and canoes or kayaks. Then you have those that mount on the console or gunnel of a motorized fishing boat, drawing it power from the battery. 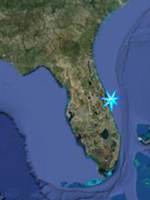 With this you should be able to see the bottom terrain, sunken logs, rockpiles, concentrations of baitfish and schools of gamefish. Hooking the Minnow; There are several ways to hook the minnow based on the type of fishing you plan on doing. The three ways presented just below are designed to allow the minnow to stay in an upright position, providing the most natural presentation possible. Float Rigging; If fishing under a bobber or float, you want to hook the minnow in the meaty part of the back near or just behind the dorsal fin. You must take care to avoid the spine, which is usually along the lateral line. A split shot sinker can be placed between the float and the bobber to provide a bit more weight for casting and also for presenting your bait at the desired depth. Freelining; You can also free-line the minnow, meaning you are using no bobber or float, no sinkers of any kind, just a hook tied to your line. 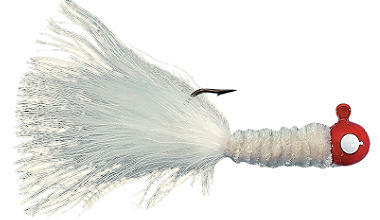 To do this hook the minnow near the tail. Understand however that this type of rigging will not provide a lot of weight for casting and if you try and whip it out as far as possible, the bait will fly much farther than the hook. Casting, Retrieving and Slow Trolling; If you are going to be moving the bait while fishing it the best hookup is the lip hook. Hook the minnow upward from the bottom lip through the top lip. 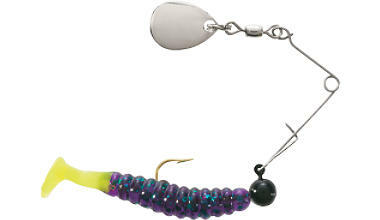 The lip hookup will also work if you are going to fish a crappie jig and wish to sweeten the jig with a live minnow. Catching a sunfish can be as easy as using a canepole, a length of line, a bobber and a hook with a worm or ball of bread and dunking it into the nearest pond. But for many, there is a pride that comes with consistently catching the largest of the species. Often collectively called "Bream" These smaller members of the sunfish family do have slightly different habits, as well as different tastes in habitats and preferred food, but the rigging for all of them is pretty much the same. Their size, size of their mouths and the size of their prey pretty much dictates light tackle or preferably ultra-light tackle. The bites are sometimes very subtle and the sensitivity you gain from using 2 to 6 lb test tackle really helps. The same floats used for crappie will work for the sunfishes, including the slip float. As in crappie fishing, there are times when the best fishing will be in deeper water. Basically the rigging is the same as crappie fishing with the exception of smaller hook sizes. The mouths on these fish are smaller, requiring smaller baits, and therfore smaller hooks. Use a size 6 or 8. Baits for panfish include a variety of invertebrates such as worms, mealworms, crickets, and grass shrimp, as well as small minnows for some species. Many of them will also take baits as simple as small pieces of white bread squeezed into a breadball. Sonar Unit; I mentioned these for use with crappie just above, but they also come in handy for bluegills and several other species of sunfish. Other than the spawning season and just after when they are feeding to recuperate, many of the largest fish will be suspended in deeper water around any structure they can find.